When my daughter was tiny, I looked for any excuse to get out of the house, so my days wouldn’t be an endless cycle of yesterday’s pajamas and sour milk. She was happiest in the morning (anyone with a small child knows that peace and quiet doesn’t come between 4 and 6 pm), so once my husband left for work, I’d get us dressed and head out to my favorite café. It was a serene space with pale, unfinished wood, communal tables, and the aroma of baking bread. I’d order a huge bowlful of café au lait, and a softboiled egg (served with some of that wonderful French country bread), and I’d eat and read the paper while my daughter napped in her carseat and I got to pretend to be a civilized human being for a few minutes. The real treat wasn’t on the menu. There were jars on each table of a brown spread resembling peanut butter, but the taste was something at once sweeter and more complex, the texture creamy but with a delightful sandy crunch. I always saved at least one slice of my soft boiled egg bread for the pâte praline, or praline paste – a hazelnut spread that I would take over Nutella any day. Of course, now my daughter no longer takes a morning nap, and the chance of getting any peace and quiet in a café with her is pretty slim. The café does sell the praline paste, but at nine dollars a jar it’s not a regular on my shopping list. So I set out to make it at home, armed with the empty jar, the ingredients list and the internet. 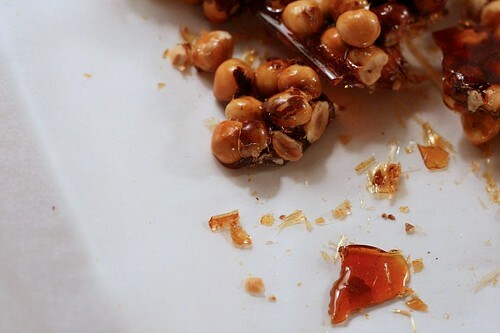 After steaming, use the dishtowel to remove the hazelnut skins. When the hazelnuts are skinned, mix 1 cup of sugar and 1 cup of water in a heavy saucepan. After you’ve stirred the sugar and water, leave on medium high heat, and DON’T TOUCH. After about 10 minutes, it will reach a lovely golden brown in its darkest part, and that’s when you add the hazelnuts. Immediately pour the hazelnut pralines onto a baking sheet lined with greased parchment. Note: My favorite café is actually one of an international chain based in Belgium, Le Pain Quotidien, which translates to “the daily bread”. Despite the general McImages that the word “chain” conjures, I think this is a very good one and is generally worthy to stand alone. I’ve eaten at three locations in New York, four in Los Angeles and one in Bruges, Belgium, where it’s called Het Dagelijksbrood (Flemish lesson of the day). The locations are remarkably consistent in terms of food and décor, and the bread and the praline paste are very good. They also make the world’s best egg salad sandwich, open faced, with anchovies on top. If you should desire to experience this for yourself, my favorite location is on Melrose in West Hollywood, where there’s an enormous patio under a large tree which is a very pleasant place to sit and enjoy a morning treat. Dear…. sweet… I… wow. That looks… overwhelmingly delicious. And far easier than I would’ve expected. Thanks for sharing! Definitely need to make this soon. Hmm, I think I might make this using almonds. I’ve been searching for the best almond flavor addition to replicate the most sublime Mandorla gelato I had in Florence. I think this would get me there. I would love to try this with a combination of nuts, or even add a little chocolate to it a la nutella. However, as is, the way you made it, looks perfect, so I’ll try it that way first. Gorgeous photos! Let’s just pretend I did not read this or commit the recipe to memory! Thanks for visiting my blog Kate and also for pointing me in the direction of your praline recipe. I know now where I went wrong. I should have kept going with the blender. I just figured it wouldn’t get any smoother! How long will the praline paste last and how do you store it? I just discovered your blog and am so glad you posted your recipe for the hazelnut praline paste. I’ve lived in New York and Aix-en-Provence (briefly), so I used to be able to acquire all manner of delicious foods, but now I am temporarily stuck in the middle of Illinois (nothing but fields of corn destined to become livestock feed), and have been pining away for this praline spread. I used to go to the Pain Quotidien on 72nd street (off of Columbus Avenue), but alas, the company doesn’t deem my current location to be worthy of a store. Everyone keeps pointing me toward Nutella, but I don’t like the stuff. And a girlfriend offered to mail me another jar of the good stuff from Quotidien, but it tastes slightly different now (and sure enough, the list of ingredients has slightly changed compared with the previous jar I consumed). I was going to make my own, but now you’ved saved me the cost and time of researching the recipe. Blanch the hazelnuts with baking soda.. it removes the skin with no rubbing, and it’s got to be easier – even if you do then have to toast. Thank you for posting this and with all the visuals. The first batch of sugar went fine but it Really moves quickly after it darkens and then it burnt..haha. Luckily I hadn’t added the nuts and had a big bowl full of water to pour the sticky stuff into. The second batch I was more careful and it came out perfect. Oh and your roasting tip with the towel was also perfect. This is for a Praline Feuillete for my first and very fancy Buche de Noel. I hope the rest comes out great. Have you ever tried rubbing the toasted hazelnuts in those plastic net bags that shallots or garlic sometimes come it? It works great and you aren’t picking hazelnut skin out of your towel for hours! Thanks, I was online looking for an easy hazelnut paste recipe since I realized it would take several days to actually find it in a store. The pictures were so helpful too, I was able to crank out some pretty tasty stuff with ease! Thanks again! Wow just made a tub of this stuff and it is really yummy! We have a hazel tree in the garden and I had scooped up a big bowlful of windfall nuts and thought that this would be the perfect way to enjoy them! I had not factored in AN HOUR of shelling the things, 3 blood blisters and a sore thumb and only a 50% success rate of finding any nut in the shells that was worth roasting! I will make it again, only next time with shop-bought shelled ones! This looks wonderful and I am eager to try this and use it in a recipe that I have for hazelnut flavored chocolates. 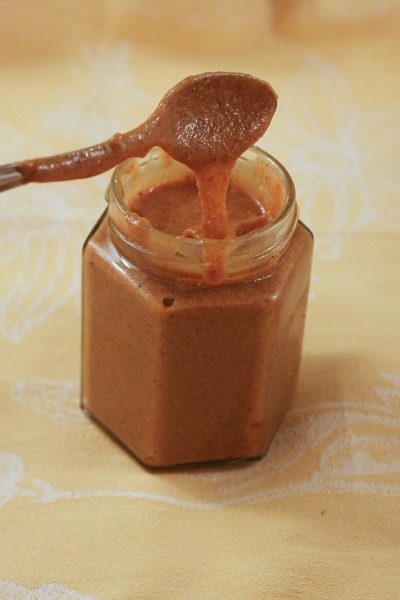 Can you tell me how much praline butter does this recipe yield? I need 8oz for my recipe, and not that I mind making more, I just want to make sure it’s enough! After seeing how expensive praline paste is I decided to make my own . We are trying to make hazelnut buttercream icing for a grad. party. Thanks so much for recipe and beautiful pictures. The recipe sounds sublime! This is great, i was looking for a recipe for praline paste to make a filling for paris brest; this is perfect! I was reading some patents for peanut butter (yes, this is where my free time goes) and they specified running the peanuts through a warm/hot grinder, which would produce more of a creamy nutella-like paste. I wonder if that is reproduce-able at home. Do you think that you could use melted unsalted butter instead of oil for this recipe? I’m not used to using savoury oils in sweet cooking and would like to use this paste as the basis for a cake filling. it looks awesome for toast though! i have no idea , i want to get it as creamy as yours in the photo..how can i reach this stage ? thank you for your help. How long and how do you store this spread? I keep it in the fridge and it lasts a couple of months.